Stolen NYPL Photo of Baseball Pioneer Al Reach Appears for Sale on eBay; Will the FBI Seize It? This Al Reach cabinet photo is currently for sale on eBay. A photograph fitting the description of a missing cabinet card of baseball pioneer Al Reach, stolen decades ago from the New York Public Library’s famous A. G. Spalding Collection, appears to have made its way onto eBay. 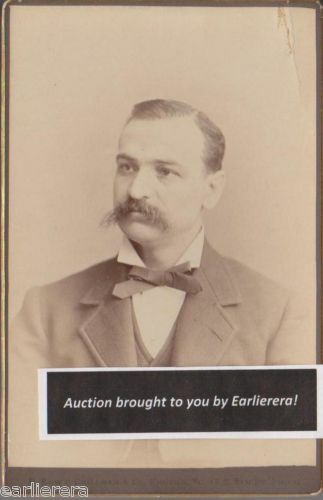 The card being offered on eBay by a seller in Indiana called “earlierera” currently has an opening bid at $49.99, but the rarity is worth several thousand dollars in the rare baseball collectibles marketplace. 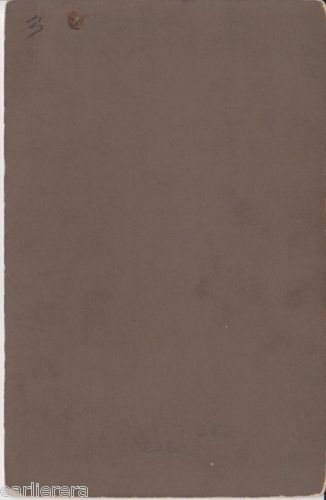 The seller also notes, “Photographs like this seldom become available in the marketplace.” The eBay seller does not give a full view of the card’s reverse, which could show evidence of the NYPL ownership marks if it is, in fact, the missing photo. 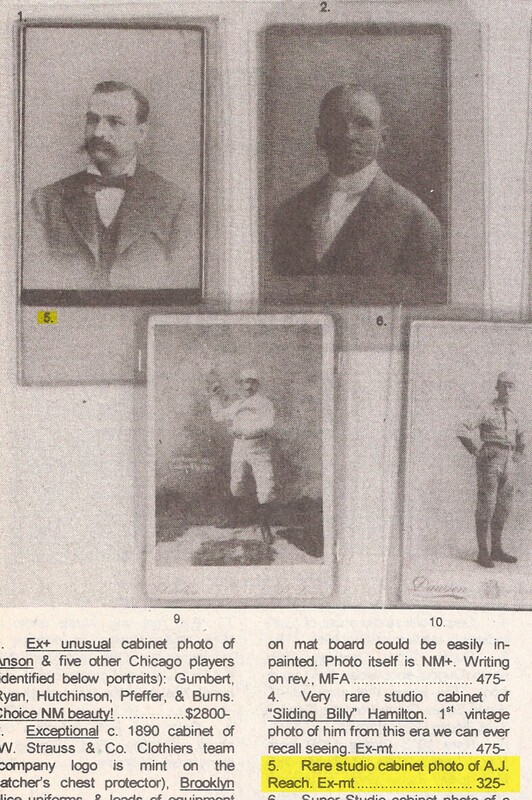 A cabinet photo of Al Reach fitting the description of the missing NYPL example was included in a report submitted to the FBI in 2009. This is the page from that report. In 2009, Haulsofshame.com submitted a report to the Federal Bureau of Investigation and the NYPL detailing items stolen from the library in the 1970s and including information related to the sale of suspect items fitting descriptions of items missing from the Spalding Collection. 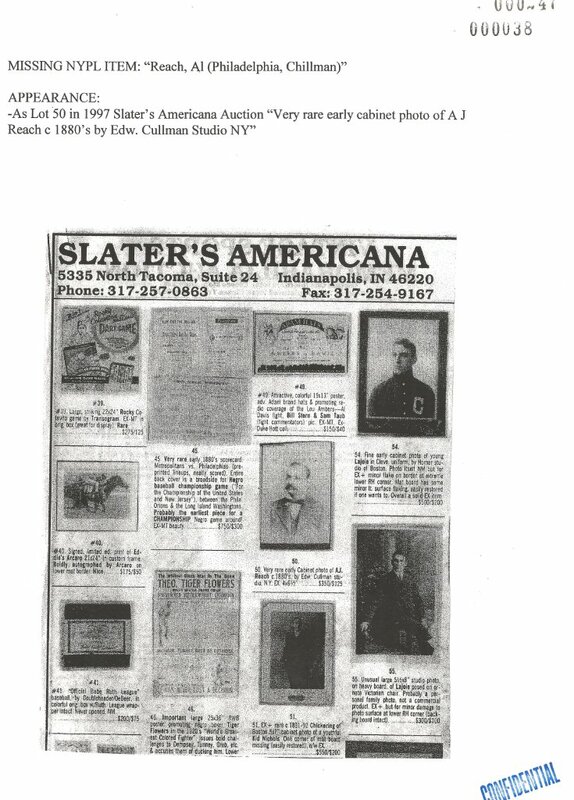 The Reach cabinet card offered by Slater’s in 1997 was included in the report submitted to the FBI as a possible match for the missing photo. 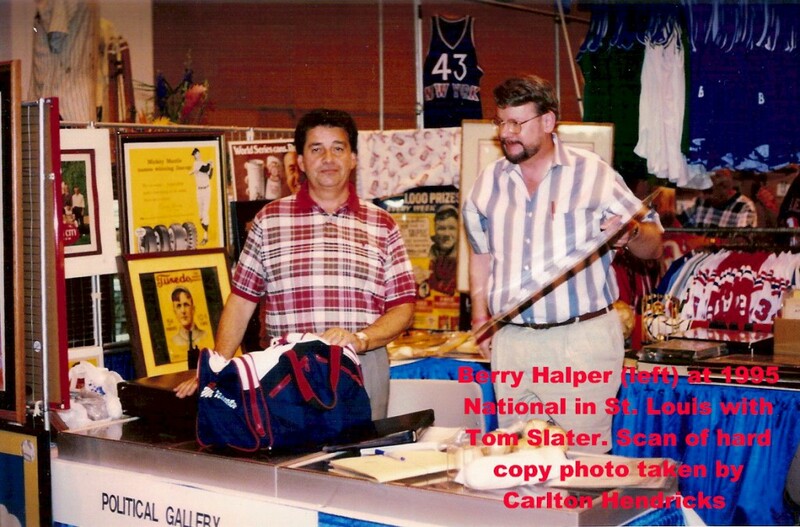 The photograph depicted in the 1997 Slater’s auction was not definitive since the quality of the image was so poor. The same cabinet photo of Al Reach offered currently on eBay was also sold at Slater's Political Gallery in 1996. The damage on the upper right corners of both photos is identical. However, Jimmy Leiderman, upon his return home to Florida from vacation recalled that the same Reach cabinet may have appeared in another Slater’s sale. Leiderman refered to a Slater’s Political Gallery catalogue from November of 1996 and found the Reach cabinet depicted as lot 5 in that auction. The photo in the 1996 sale is the exact same one that is being offered on eBay. Both photographs exhibit the exact same crease and damage on the upper right corner of the albumen print. Jimmy Leiderman requested additional scans of the reverse of the card from the seller and this morning the seller posted the image of the reverse on eBay. 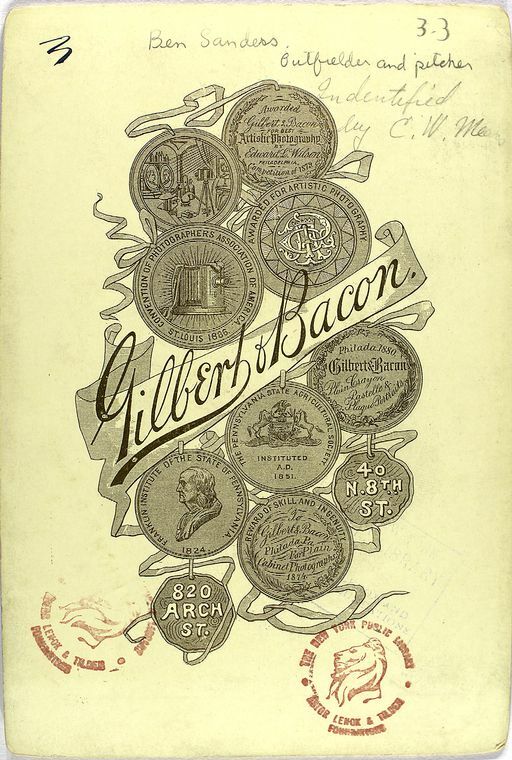 The image confirmed that the card is the missing Reach from the NYPL, evidenced by the tell-tale numeral “3″ handwritten on the upper left corner. The numeral was originally written by baseball researcher Charles W. Mears sometime after1922, as Mears was responsible for cataloguing the collection for storage in boxes. The “3″ indicates that the card was stored in “Box 3″ of the Spalding Collection. The eBay posting of the reverse of the Reach cabinet card confirms that the card is the property of the NYPL. The tell-tale numeral "3" in the upper left hand corner shows the card was originally stored in "Box 3" of the Spalding Collection. All of the other photographs stored in “Box 3″ of the Spalding Collection bear the exact same “3″ in the identical handwriting of Mears. Additionally, the card of Ben Sanders, currently in the NYPL collection, bears an inscription stating, “Identified by C. W. Mears.” The Reach card likely has the same NYPL ownership stamps, but the quality of the image posted on eBay is not sufficient to see those marks on the card’s brown board mount. This card of player Ben Sanders in the NYPL's Spalding Collection bears the same handwritten "3" in the corner as the Reach cabinet being sold on eBay. Both were once stored together in the same "Box 3" of the Spalding Collection. Halper, who died in 2005, has been documented as having owned and sold more stolen materials from the NYPL collection than any other source. The 1999 auction of his collection at Sotheby’s included a myriad of documents and photographs confirmed as missing items from the NYPL’s Spalding Collection and the Boston Public Library’s McGreevy Collection. Both the FBI and the NYPL have been informed of the eBay sale of the missing Reach cabinet. The Federal investigation into the NYPL thefts has dragged on for over two years. Special Agent Jim Margolin of the New York FBI’s press office did not return calls for comment. UPDATE (Wed. Aug 31): Since it was revealed in our report yesterday that the Al Reach cabinet being offered on eBay is the missing photo stolen from the New York Public Library, 13 bids have been placed on the photo with eBay seller “earlierera.” Haulsofshame.com has left a voicemail for “earlierera,” but we have not received a response. We have ended the auction early for the following reason: There have been questions raised relating to title regarding this item. In response, we have gone to the trouble to contact the FBI to request their help in verifying that there is no title claim to this item by the NYPL or any other institution. Per our request, they are allowing us to send the cabinet card to them to examine. We anticipate that they will verify for us that there is absolutely NO claim of ownership by the NYPL and no title issue with this item. If that is the case, we will eagerly run this auction again after this is verified and the card is returned. They have told us that this may take a couple of weeks. To all bidders: we took this action to protect you, Ebay’s valued bidders. Thank you for your understanding and we hope to have this up again very soon. Well one thing for sure, the FBI has this one dead to rights and if they dont go after E-bay and the owner of it,there is something definately wrong with their investigation team.They need to nip this one right away, before some fool out there ends up with stolen property and in all my years in Law Enforcement, that is jail or prison time. I can’t understand why the NYPL doesn’t move aggressively to take back its stolen treasures. If you can believe it, the card has even received another bid and is up to $112.50. I guess no one is surprised that Barry Halper is somewhere in the mix here. What else did he have in that bag? Seller has been contacted and must know by now the origins of this fine piece of baseball history. Hopefully he’ll do the right thing by removing the eBay listing and contacting the authorities. You’re watching the ultimate definition of a reality show… right here, right now! Watch live how an honest collector bids on a piece of stolen property while the real owner and legal authorities do nothing to prevent it from happening. BOOKMAN: I saw you on T.V. once; I remembered your name–from my list. I lookedit up. Sure enough, it checked out. You think because you’re a celebritythat somehow the law doesn’t apply to you, that you’re above the law? BOOKMAN: Well, let me tell you something, funny boy. Y’know that little stamp,the one that says “New York Public Library”? Well that may not mean anything to you, but that means a lot to me. One whole hell of a lot. libraries, people like you and me. Maybe. Sure, we’re too old to change the world, but what about that kid, sitting down, opening a book, right now, in a branch at the local library and finding drawings of pee-pees and wee-wees on the Cat in the Hat and the Five Chinese Brothers? your good-time buddies. Well I got a flash for ya, joy-boy: Party timeis over. Y’got seven days, Seinfeld. That is one week! ….15 bids at $200.05 A steal at that price. Pretty much guarantee you that the NYPL will not make an affirmative title claim here, and that the item will go back to the auction seller. On behalf of all the bidders on this item,I am glad to see that the party involved has pulled it from e-bay, to save a lot of embarrasment to the bidders.When the FBI determines that this indeed is the stolen piece and if it really is,I would hope that the NYPL would store it more secure, so it doesnt walk again. Yeepe!!! It’s open stealing season at the New York Public Library! Go grab yourself a free Harry Wright photo before someone else does because nobody is going to stop you. Thank you Melany and Earlierera for opening my eyes! Thank you NY Public Library and FBI! I can now become a Halper-like collector. Yeepe!!! The ebay seller is delusional if he thinks he’s getting that al reach card back. How did he get it in the first place? If he bougt it at the national how did it get in those two auctions? Hopefully the seller will be sharing that info with the fbi. looks like the fbi and nypl are following through, good to see they are on the ball. Who would have thought the New York-Penn League would have such an awesome collection of baseball stuff. I traded one of Babe Ruth’s “game-used” condoms for the Al Reach cabinet card back in 1977, guys. I also find it preposterous that now you’re saying my Cy Young uniforms with the velcro straps are fake. I guess next you’ll be saying my printed email exchanges between Eddie Plank and Walter Johnson are fake too? Or Ty Cobb’s amazon.com gift card?